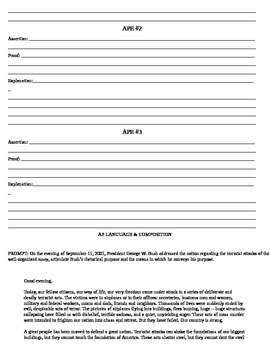 The following file is a mini unit I use with my AP English Language class to get us started thinking about rhetorical analysis. I usually do this in the first week of school. 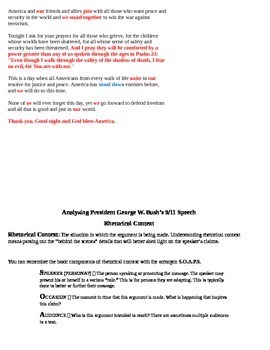 - Full text of President George W. Bush's speech on 9/11, formatted to give students room to annotate. 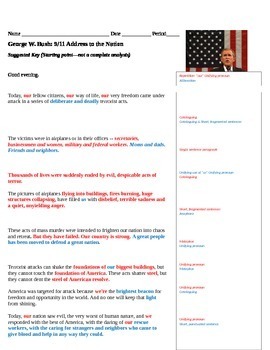 - Full text of President George W. Bush's speech on 9/11, with a starter key pointing out basic rhetorical moves Bush is making in regards to language and structure.